If Jesus Didn’t Die, Who Was That Man That Came Out Of The Tomb? Today Christians all over the world will celebrate “Easter.” Sadly, when you do a google image search using the word “Easter,” you will see mostly images of little rabbits, eggs, and spring flowers. But Easter is actually the name given for the day over 2,000 years ago when Christians believe that Jesus rose from the dead after being executed (by crucifixion). (You can read about the resurrection of Jesus and the empty tomb in the Injeel: Matthew 28:1-15, Mark 16:1-20, Luke 24:1-47, John 20:1-29). What this means is, I am basing my belief that I will go to heaven solely, completely, emphatically on 2 events that I believe to be entirely historical: the death of Jesus on a Roman cross for my sins and the subsequent resurrection of Jesus from the dead to prove he was who he said he was. Is there any evidence that Jesus rose from the dead? In this blog post, I quote a speaker and author, Josh McDowell, regarding evidence for the resurrection of Jesus from the dead. The body of Jesus, in accordance with Jewish burial custom, was wrapped in a linen cloth. About 100 pounds of aromatic spices, mixed together to form a gummy substance, were applied to the wrappings of cloth about the body. After the body was placed in a solid rock tomb, an extremely large stone was rolled against the entrance of the tomb. Large stones weighing approximately two tons were normally rolled (by means of levers) against a tomb entrance. A Roman guard of strictly disciplined fighting men was stationed to guard the tomb. This guard affixed on the tomb the Roman seal, which was meant to prevent any attempt at vandalizing the sepulcher. Anyone trying to move the stone from the tomb’s entrance would have broken the seal and thus incurred the wrath of Roman law. So. . .what are the evidences for the resurrection of Jesus from the dead? The first obvious fact was the breaking of the seal that stood for the power and authority of the Roman Empire. The consequences of breaking the seal were extremely severe. If the responsible people were apprehended, it meant automatic execution by crucifixion upside down. People feared the breaking of the seal. Jesus’ disciples displayed signs of cowardice when they hid themselves after his death and certainly would not have had the courage to fight off Roman soldiers, break the seal, and steal his body. If the resurrection claim was merely a lie – some kind of hoax – the Jewish authorities would have lost no time in producing the body of Jesus from the tomb, thus effectively quenching for all time any rumor of his resurrection. On that Sunday morning the first thing that impressed the people who approached the tomb was the unusual position of the one and a half to two ton stone that had been lodged in front of the doorway. All the Gospel writers mention it. Those who observed the stone after the resurrection describe its position as having been rolled up a slope away not just from the entrance of the tomb, but from the entire massive sepulcher. Now, I ask you, if the disciples had wanted to come in, tiptoe around the sleeping guards, and then roll the stone over and steal Jesus’ body, how could they have done that without the guards’ awareness? Christ appeared alive to his closest followers – and to many others – on several occasions after the cataclysmic events of that first Easter. Claims that the appearances of Jesus after the resurrection were either illusions or hallucinations are unsupported by the psychological principles governing the appearances of hallucinations – namely that different people cannot see the same hallucination simultaneously. The New Testament accounts of the resurrection were being circulated within the lifetimes of men and women alive at the time of the resurrection. Those people could certainly have confirmed or denied the accuracy of such accounts. They were still alive and could be questioned. The strongest evidence of all for the resurrection of Jesus from the dead is the way those early Christians lived – and died. We must ask ourselves: What caused them to go everywhere telling the message of the risen Christ? Instead, those early Christians were beaten, stoned to death, thrown to the lions, tortured and crucified. Every conceivable method was used to stop them from talking. Yet, they laid down their lives as the ultimate proof of their complete confidence in the truth of their message: Jesus died and rose from the dead. 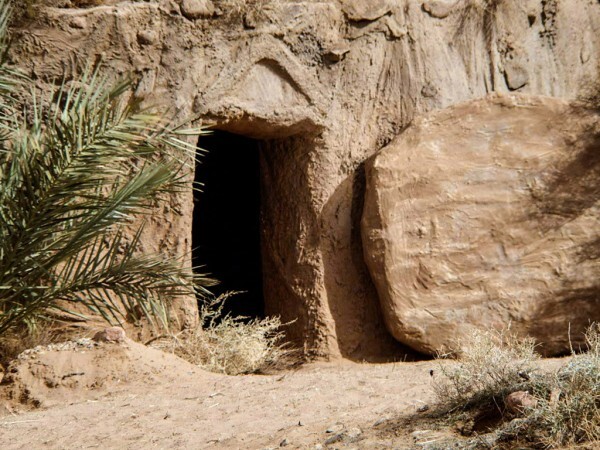 Postscript to my Muslim friends: how do you evaluate these evidences for the empty tomb – for the resurrection of Jesus from the dead? I am respectfully assuming you will answer that the Bible has been corrupted and changed. What is the evidence that it was changed? Until I see evidence that the Bible was changed, I will maintain my belief that it is true and accurate. And I will maintain my belief in the evidences from that first Easter – evidences for an empty tomb. I am staking my eternal destiny on it and invite you to carefully and objectively examine the evidence for yourself – for your eternal destiny. As always, I love you, my Muslim friends. This entry was posted in Uncategorized by Mark Vanderput. Bookmark the permalink. Your email address will not be published. Feel free to use a nickname.